270 p., 25 ill., 14,7 x 20,8 cm. With contributions by Ronald Britton, Joachim F. Danckwardt, Friedrich-Wilhelm Eickhoff, Lotte Köhler, Rosine Jozef Perelberg, Gerhard Schneider, Daniel H. Widlöcher and Konstanze Zinnecker-Mallmann. This is an account of the ego and super-ego when their relationship is markedly adversarial, illuminated by some post-modern commentaries on the Book of Job. A clinical situation is also described that is analogous to that of Job in which the ego is confronted with an ostensibly supportive super-ego demanding worship and subservience. The author argues that even when the super-ego retains its adverse character, analysis can help the patient by changing the relationship between the ego and super-ego. In particular it can help to wrest from the super-ego the function of judging both internal and external reality that it has usurped. This reclamation is the ego’s emancipation from the super-ego and is accomplished by the ego making a judgement on the super-ego. The third position, of self observation, belongs within the ego and not the super-ego; that position, from which we can view ourselves whilst being ourselves, we need to find within part of our personality that we identify as our own person. If we vacate it we become the creatures of our conscience. We cannot avoid having a conscience; we cannot abolish the super-ego but we need to be able to put it in its place. It is suggested that emancipation of the ego reclaims the right to make judgements. It is a task of reclamation: where super-ego was ego shall be. Zur Einführung des Narzißmus stellte einen Wendepunkt in der Psychoanalyse dar. Obwohl der Narzißmus ein Konzept ist, auf das sich sehr viele wichtige Denker jahrzehntelang nicht explizit bezogen haben, könnte man sagen, daß seit Freud kein psychoanalytischer Beitrag geschrieben wurde, der nicht implizit die Veränderungen im Denken berücksichtigt, die sich durch jene Abhandlung ergeben haben. In der vorliegenden Arbeit vergleicht die Autorin zwei verschiedenartige narzißtische Konfigurationen: In der ersten wird der Intoleranz für den anderen durch Ausstoßung und Gewalt begegnet, in der zweiten durch Rückzug. Die Autorin vergleicht Patienten, die manifestes Gewaltverhalten zeigen, mit solchen, die nicht gewalttätig wurden, obwohl sie ähnliche Lebensgeschichten wie die ersten aufweisen, so daß eine Vorhersage von Gewalttaten nahegelegen hätte. Tiefgreifende Unterschiede bestehen in bezug auf die Reaktionen, welche die Patienten in der Gegenübertragung auslösen. Darüber hinaus wird die Ansicht vertreten, daß die Behandlung von narzißtischen Patienten in den vergangenen Jahren das Verständnis einer Modalität der Depression ermöglichte. In Anlehnung an Green argumentiert die Autorin, daß man auf nutzlose Debatten über konzeptuelle Fragen der Entwicklung des Narzißmus verzichten und stattdessen den narzißtischen Aspekt in allen analytischen Beziehungen herausarbeiten müsse, um die narzißtische Übertragung bei unterschiedlichen Psychopathologien zu identifizieren. A supervised analysis conducted more than 30 years ago is revisited. In order to illustrate, how new findings in the field of developmental psychology may facilitate the understanding of transference. At that time it was the so called »Separation-Individuation Process« as observed and described by M. Mahler et al. The same case material is being used to discuss, how far some of the new findings of disciplines related to the field of psychoanalysis – especially of infant research like the one of D. Stern, attachment theory and the psychology of cognition – can be of relevance for the understanding of the therapeutic process. There are severely disturbed patients who may by way of reaction develop psychotic states, tend towards suicidal acts, or display impulses of violent (and sometimes even murderous) aggressions against the analyst, if processes of significant psychic change emerge during treatment. The author suggests that the notions of identity and identity resistance are theoretically as well as clinically appropriate for dealing with such phenomena. Two case histories illustrate the basic threat occuring through psychic change. The author also shows that crucial points emerged during these analytic processes – crucial points at which the identity of both patients was fundamentally threatened by the analytic process and, by way of consequence, by the analyst himself. In the discussion, the identity theoretical perspective is related to relevant concepts in this area of research. In addition, the clinical use of the identity theoretical perspective is assessed: This perspective not only helps the analyst in understanding his or her countertransference attitude towards the patient as a whole person, but also enables him or her to recognize that changes like these involve a basic transformation in the patient’s identity. Thus, psychic change in these patients turns out to be a catastrophic one. We know how shocked Freud had been when reproached by Fließ as being a »mind-reader« and when, several years later, Ferenczi had also claimed himself as such, as a psychoanalyst. This idea was in opposition to the scientific ideal which Freud attributed to its method. However this does not prevent him from later responding to the question of »thought transference« and to focus on thought induction in the treatment and telepathic phenomena. With the importance accorded in psychoanalysis to counter-transference in psychoanalytic listening, the question of thought induction has been implicitly raised. Starting from a novel by Edgar Allan Poe, the paper will attempt to explain it by the study of the associative process and the manner in which it proceeds in parallel in inter-subjectivity. Under the term of co-thinking this reciprocal associative process, the effect of inter-subjective thought induction, will be described using two clinical illustrations. This point of view enables one to clarify the links between co-thinking and counter-transference and empathy processes. One can then envisage the consequences of a comparative study between psychoanalytic listening and psychotherapeutic listening. Finally, the question of supervision will be revisited as a listening to the third in inter-subjective listening. The idea of second-level co-thinking will be discussed. We need not abandon Freud’s positive credo – the facts do exist. Nonetheless we must conclude that thought transference is just a fact. Nachträglichkeit provides the memory, not the event with traumatic significance and means a circular complementarity of both directions of time. Conceived by Freud as early as 1895 in the Project for a Scientific Psychology, the concept remains in his work without official status but is thanks to its character of biphasic development and latency indispensable for understanding temporal connections and psychic causality. As an implicit principle it is linked with the postponement and biphasic onset of sexual life and retains its sometimes hidden importance until the late Moses-study. Temporarily virtually forgotten it was recalled to memory by Lacan in 1953. Translations into French as après-coup and into English as deferred action emphasized the two vectors (retroactivity and after-effect) separately which are united in the substantive form coined by Freud. Unnoticed it played a part in many aspects of clinical practice, especially in Winnicott’s Fear of Breakdown and the subsequent (nachträglichen) working through of unconscious infantile and transgenerational conflicts in the hic et nunc et mecum of the psychoanalytic dialogue. Wolfgang Loch, to whose memory this paper is dedicated, extended Freud’s concept of Nachträglichkeit in a constructivistic way, advocating an art of interpretation as an innovative enterprise through which connections are not only unmasked but also created, constituted by subsequent (nachträgliche) reinterpretation of a subjective past. A symposion in Paris in 1998 gave a strong impulse for a revived reflection on Nachträglichkeit, which is particularly evident in a dialogue between Haydée Faimberg and Ignes Sodré. The paper refers to the interdisciplinary reception of the concept of Nachträglichkeit, especially in the cultural sciences. So far the connection between treatment of patients and the epigenetic post-neurotic development has not been a major topic of investigation. Because of their artificial separation by the Psychotherapy Guidelines (Psychotherapierichtlinien) we do not know enough about the relation which facilitates epigenetic post-neurotic growth – in analogy to Sigmund Freud’s formulation how to provide »the most favourable conditions for ego-functioning«. In the work with creative people, this question can be scrutinized, as there are certain analogies between the psychoanalytic and the creative process. They can also be found in Paul Klee (1879-1940), who with regard to art history belongs to the first artists, who included in their artistic production the shaping of experiences and aesthetics as a process. In 1900 Klee started an originally deliberately autobiographically, partly set-up in a self-stylized way, but unconsciously hidden self-analysis in the form of a diary. At the same time he also developed his genesis theory. In 1931 he had a lively artistic encounter with an artist, the 15 years younger Swiss sculptor Alexander Zschokke (1894-1981). During the sessions, in which Zschokke created a portrait-bust of Klee, Klee happened to be the object of his own genesis theory. Klee thus experienced directly his artistic program of viewing and creating as coinciding and coming into existence. Due to these experiences he, two years later developed the curved line (container – contained), which decisively influenced his late work. This result is relevant in art history, but in this paper these artistic sessions are investigated with regard to psychoanalytical viewpoints as a parable for the psychoanalytical situation, and the interaction processes are described. Finally, this form of epigenetic growth is contrasted with different forms of learning and coming into existence in psychoanalytical institutions. Konstanze Zinnecker-Mallmann: Der doppelte Erich. Das Doppelgängermotiv bei Erich Kästner. The genesis of this article was simple curiosity about Erich Kästner, writer of popular children’s books and verses. Who was he really? As the author delved into his biography and gained more insight into his fate, she began to feel like one of his sleuthing heroes. She became an analytic investigator of the Doppelgänger theme in his work and life. Kästner seems to have had pairs of doubles, benign and malign ones. The benign doubles: being the ideal of his mother, the clandestine substitute ›father‹-figure Doctor Emil Zimmermann, and last but not least, Erich Kästner’s own persona as creative writer, working in partnership with his illustrators to produce his remarkable works. That Kästner’s private life could not match his public success was due to his unresolved relationship with his mother. After she died he took hope in the relationship to his young lover and their son. The difficulties with his mother were repeated in the relationship to his partner, however, his separation conflict remaining unresolved. In the end he lapsed into deep self-contempt, substituting a malignant persona or double for the benign one. He requested that the last waltzes from Der Rosenkavalier be played at his funeral in lieu of eulogy: perhaps a reflection of all the tragic-comic substitute roles in his life. 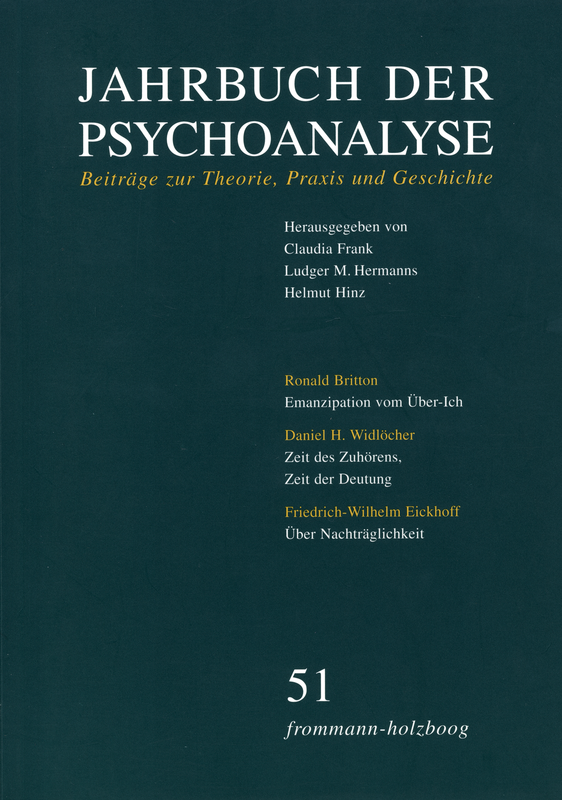 Das Jahrbuch gibt ein breites Spektrum über die aktuelle praxeologische und theoretische Entwicklung der Psychoanalyse und zeigt darüber hinaus Perspektiven und Möglichkeiten ihrer Anwendung.